MILLINGTON, Tenn. -- A six-time IHRA Top Fuel World Champion with 52 national event victories and two world records, Clay Millican is without a doubt one of the greatest drivers in the history of the International Hot Rod AssociationT (IHRA). And now, Millican's Top Fuel Dragster will sport a look worthy of its driver's remarkable accomplishments in IHRA competition at the Summit Racing Equipment World Finals at Memphis International Raceway™ (MIR). Millican will debut a brand new design on his Top Fuel Dragster in his return to IHRA competition at the Summit Racing Equipment World Finals at Memphis International Raceway the weekend of October 11-12. The Tennessean will unveil the new design at his home track in Millington on Friday, October 11, in front of the jam-packed grandstands at MIR, as he goes head-to-head in a battle of former IHRA world champions against longtime rival Bruce Litton. 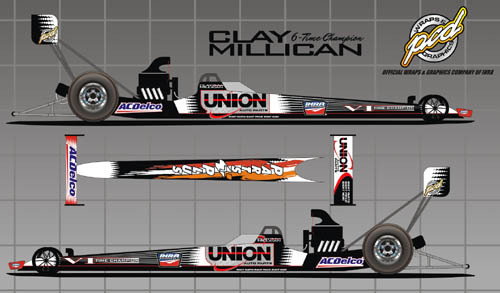 The special paint scheme, produced by PCD Wraps and Graphics, will pay tribute to Millican's six IHRA Championships and will feature sponsors Parts Plus, Union Auto Parts and AC Delco. The dragster will include the brand new IHRA Nitro Jam logo which will also be debuted at the event. "Memphis International Raceway is excited to be hosting such a tremendous event that will leave both fans and racers on the edge of their seats," said Pam Kendrick, Vice President and General Manager at Memphis International Raceway. "This event will have something for everyone, including the return of our very own hometown favorite Clay Millican. Clay's car will have great sponsors on board and all of us here at MIR are looking forward to seeing Clay back in IHRA competition. It will be an event fans won't want to miss." Millican won six consecutive IHRA Top Fuel championships from 2001-2006, winning 52 races and visiting more than 60 finals during that span. He won 68 percent of the races during his six-year reign atop the IHRA Top Fuel world, including recording an amazing 21 wins in 24 races during a two-year span in the mid-2000s. He also set both ends of the IHRA Top Fuel world record and was the very first IHRA driver to dip into the 4.40s on the quarter-mile. And the man that was runner-up during nearly all of those Millican wins was Bruce Litton. Litton is IHRA's second most decorated Top Fuel competitor with one championship in 2007 and the fifth most wins in IHRA history under the previous IHRA format. Under the new Nitro Jam system Litton has added even more wins to his resume. From 2002 to 2004 Millican and Litton met in the finals of Top Fuel 17 times, including nine meetings in 12 races in 2002 alone. In Memphis the pair will reignite that rivalry at one of the biggest races in IHRA Nitro Jam history. Millican's return to quarter-mile competition with the IHRA will be a special moment in the history of the IHRA and Memphis International Raceway, and Chase Huffman, designer of Millican's new dragster style, is looking forward to being a part of that special moment. "I have always been a huge fan of Clay. He is a great driver and an even better person and it is an honor to work on this project as Clay returns to IHRA," said Huffman, owner of PCD Wraps and Graphics. "We have worked closely with everyone to get this design perfect. This will actually be our first Top Fuel Dragster wrap and we hope it is not the last." The 2013 IHRA Summit Racing Equipment World Finals will feature exciting races by nitro-burning Top Fuel Dragsters, AMSOIL Prostalgia Nitro Funny Cars, Nitro Harleys and Fuel Altereds, joining a thrilling show starring Jet Funny Cars, fireworks and a "monster" finale as the 30,000 horsepower Super Shockwave jet-powered 1957 Chevy takes on the world famous Grave Digger monster truck. The event will also include the world championship races in 10 IHRA sportsman classes. Tickets to the IHRA Summit Racing Equipment World Finals are available online at www.nitrojam.com or by calling MIR at (901) 969-7223. Don't miss the return of Clay Millican and the crowning of IHRA's 2013 World Champions, October 11-12 at Memphis International Raceway.